So now I have reached the inevitable stage in a build where the big pieces are together and things start to seemingly slow down because the parts get smaller and require careful setting and epoxying. It's not that I've stopped doing work, it just feels that way sometimes because you don't see as many big changes. 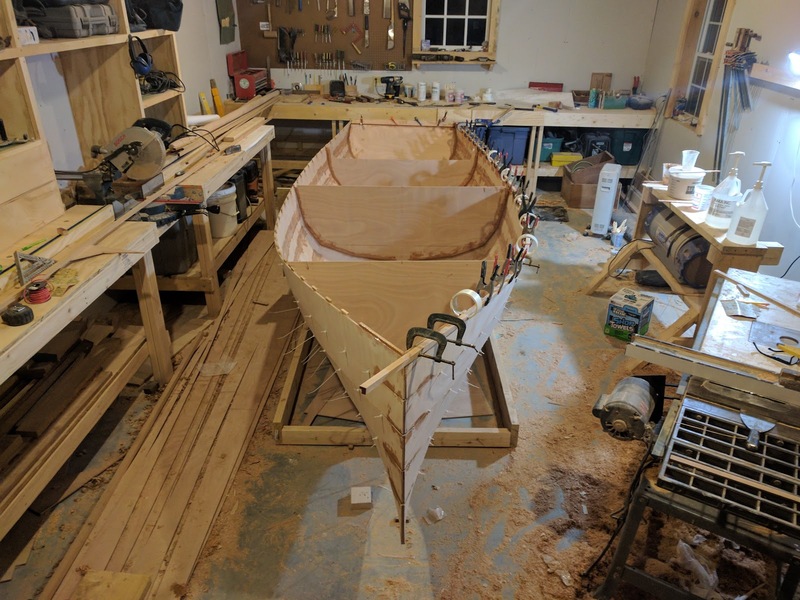 With that said, I did reach a milestone earlier this evening and finished gluing up both sides of the outside gunwale (outwale). 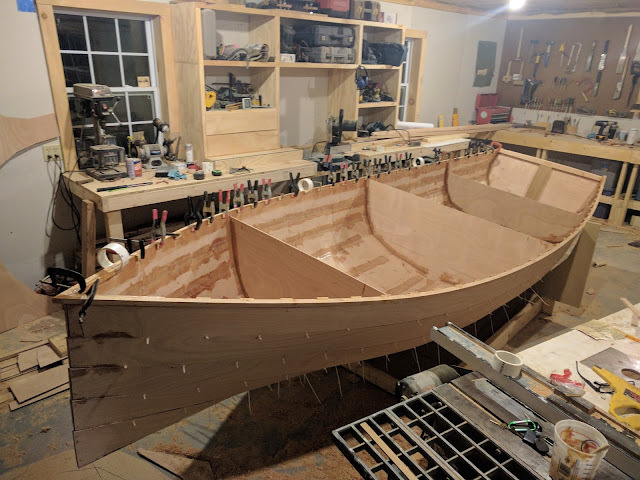 The reason it's a milestone is that I've finished the first stage of the build and now it's time to turn the boat over and start glassing up the bottom. I should thank Tom, who commented on my last post. 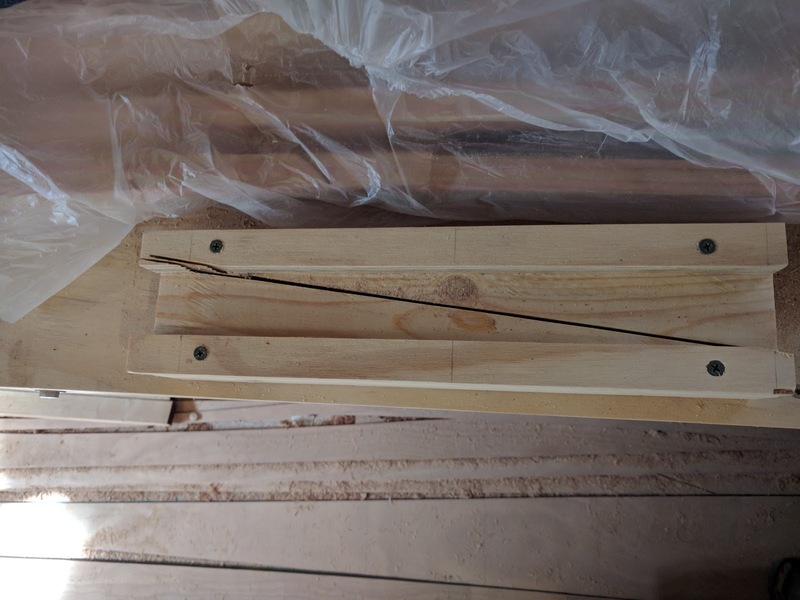 I was lamenting the fact that I didn't have enough spring clamps to glue on all the spacer blocks for the scuppered inwale and Tom pointed out that I could just slice up a length of PVC pipe and cut them lengthwise to make a super cheap spring clamp. I had enough PVC pipe on hand to make 20 and that allowed me to move forward much faster. While the spacer blocks were curing in place, I cut out the 20 x 20 mm outwale pieces and cut 8:1 scarphs to get the lengths I needed. 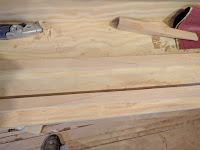 To do so, I built a mini miter box to do the cut and it also served as a jig to glue them up. Once the epoxy had cured and I sanded them down the glue lines looked really good. 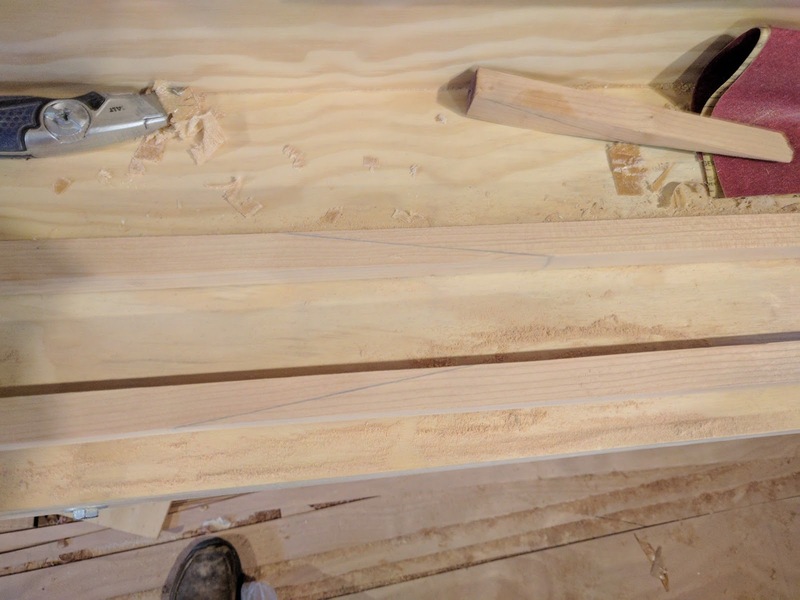 Next, I milled a 6 x 8 mm rabbet in both of the scarfed outwales. It's a little hard to see in pictures but I epoxied the spacer blocks about 8 mm proud of the top plank. 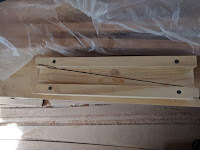 I did this so when the outwale was set, the rabbet would cover up the plywood edges. I never liked the looked of exposed plywood edges and figured that sealing those edges with epoxy and then covering them with the outwales would help keep out moisture. Last night I lured my wife over to the shop to help butter and bend on the first rabbeted outwale. I mixed up two small batches of wood flour thickened epoxy and had my wife start 'painting' the outwale with the mayo consistency epoxy while I did the same on the outboard side of each spacer block. Once done, we simply mashed it into place and worked our way forward, clamping it onto the curve of the hull as we went. I needed to use a few c-clamps along the way because just using spring clamps wasn't enough. It went great and once it was on, we spent 20 minutes or so cleaning up all the squeeze out before quitting for the night. The last few days wasn't without it's trials though; I managed to get an extremely large cherry sliver in the palm of my hand when planing down one of the outwales. My wife managed to get it out with some serious digging, but it ended my work for the night. I also knocked over four ounces of unmixed resin on the shop floor and didn't notice it until it spread out all over and I had walked in it. My wife managed to drag her hair in thickened epoxy when we were moving the boat a few feet. She was not happy. To my eyes, you've made great progress, congratulations! Especially in getting your wife to come out and help ya! Although next time... put an old shower cap on her, protect the hair. Don't thank me for the C-clamp thing, I stole it from someone else. Nathaniel Herreshoff maybe... ;-) Can never have enough clamps, especially for gunwales. 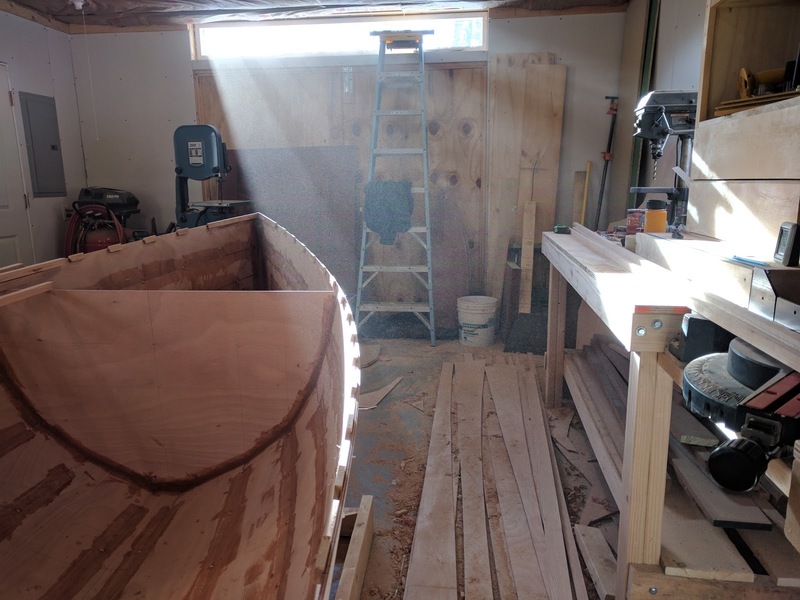 The success of a boat project, actually any woodworking endeavour, is directly proportional to how much blood you spill on it. So that was a GOOD-LUCK splinter you got in your hand! But next time.. gloves maybe. I use gloves religiously (I'm a klutz), cut out the fingertips for feel.